The Alexander Turnbull Library has announced its acquisition of a major collection of Robin Hyde’s literary papers. To celebrate the occasion there will be a reception and reading at the National Library in Wellington on February 26 as per the invitation above. The prose from China became her last book, the travel memoir and anti-war polemic Dragon Rampant (1939). The poems, dazzling collages of image and memory, were already more than fragmentary when she wrote from Shanghai (she was always supercritical of her own work). 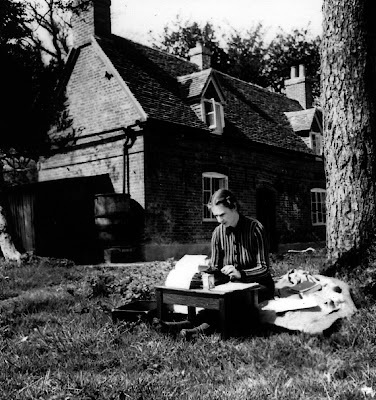 By the time she was typing in the spring sunshine outside Bishop's Barn in April 1939, they had become the 20-page typescript from which the published sequence derives. That typescript is part of the vast treasury of manuscripts and photographs that has come to the Turnbull as part of the Derek Challis Papers. The collection is now available to researchers and interested readers of Hyde. I attended this very special celebration and have posted a report on it on Beatties Book Blog.